Greg Feith, former NTSB accident investigator, presenting “Lessons Learned” to the Colorado Pilot’s Association. 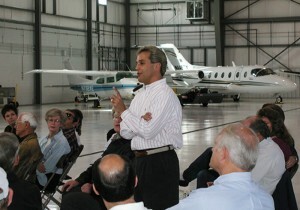 Signature Flight Support (APA) sponsored the presentation. After 22 years as an investigator with the National Transportation Safety Board, Greg Feith realized that the cause of most aviation accidents could be traced to a handful of things: lack of ongoing crew training, poor decision-making, inadequate communication skills, and inattention and/or a poor attitude. As a self-proclaimed “evangelist for flight safety,” Feith has joined with Signature Flight Support to present his seminar, “Lessons Learned,” at Signature FBOs across the country. According to Feith, one of the most educationally underserved segments of the aviation marketplace is the group comprised of corporate, fractional and charter pilots; that group makes up the core of Signature’s business. Feith challenges the assumption that aviation is “safe.” By using the dictionary definition of safety—”secure from danger, harm, or evil; free from risk”—he points out that aviation safety should more accurately be called aviation risk management. He stresses that pilots should become fully educated, not just by learning how to fly, but also by learning and understanding the underlying principles of aviation. Information is a crucial component in risk management. In a recent presentation to the Colorado Pilot’s Association at Signature’s Centennial Airport hangar, he played a tape of the conversation between a pilot, unclear about his situation, and the air traffic controller directing him, not listening to what the pilot was saying. The result was a fatal crash. Tragedies can be caused by a single catastrophic event or a series of poor decisions. In the previous case, the pilot chose to fly in bad weather at night over unfamiliar terrain because he felt pressure to get home for his job. “Any time you combine outside pressure, time constraints and the human factor, things can go bad,” cautions Feith. In the case of Swissair 111, which crashed off of Nova Scotia in 1998, pilots, following their procedures to the letter, didn’t have a complete understanding of a situation unfolding. It didn’t occur to them that smoke in the cockpit could be indicative of a problem much more serious than overheated air conditioning. By the time they realized they had a fire in the overhead, they were on a course that cost their lives and that of all onboard. Feith’s goal is to re-heighten awareness and point out that no one is immune to an accident. He emphasizes that we can all learn from other’s mistakes. Sometimes, a minor error leads to tragic consequences. He tells the story of the Convair 580 flight crew that missed a single item on the preflight checklist because the flight attendant interrupted them when she handed the captain the flight’s head count. They failed to turn on the windshield heater, and on final approach, a duck smashed through the frozen windshield, nearly killing the captain. Pay attention. Communicate. Stay informed. They’re simple lessons—not just for flying, but also for living. Feith delivers those lessons in a powerful way. Feith will be presenting “Lessons Learned” at the Minnesota Business Aviation Association meeting this fall, and at Signature stations around the country in upcoming months. The Signature presentations are free, but reservations are a must.